We wrote yesterday about the things to watch out for with the launch of Windows 8. One of those things was SmartGlass and Microsoft have now revealed more ahead of the launch. 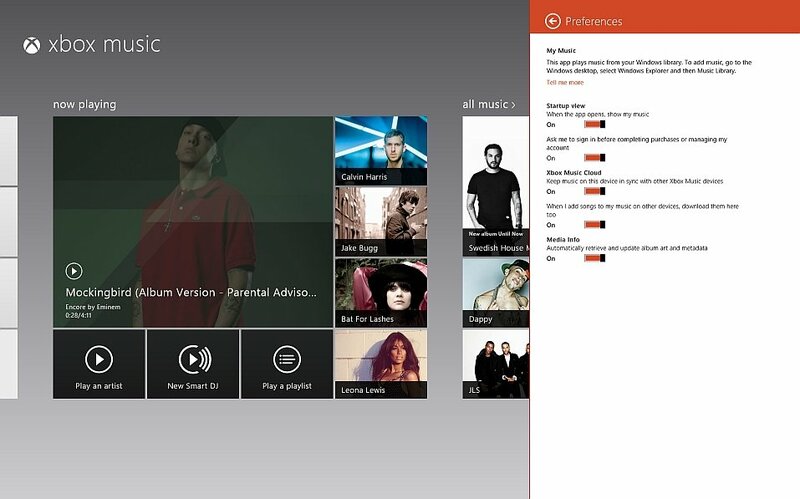 They have updated the Windows 8 apps and free streaming is now available for Xbox Music. As part of a broader roll out of better entertainment services, SmartGlass aims to improve the ability to use tablets and smartphones to better control the experience with the Xbox 360. The video goes on to show how internet sessions can be shared from Windows Phone 8 to the console, along with bouncing it back from the console to your tablet. It’s looking awesome, check out the video after the break. "One browsing session travelling across three screens, that’s the magic of SmartGlass"
Samsung's ATIV S ushered into duty sharing a website with the Xbox..
During the video we can see a neat piece of integration between Windows Phone 8 on an ATIV S and the Xbox 360. While using IE on the phone he taps the context menu and selects share to Xbox, the browser session is sent over to the console and displays there. Text can be entered using the phones superior keyboard and gestures can be used to control the screen. Some of the features we have already seen but it’s nice to see them working as we hit the final stages. After that we see how using SmartGlass app on the phone, it’s possible to bring the browser session back to the tablet by pressing the Play Here button, launching IE on the tablet. In his words “one browsing session travelling across three screens, that’s the magic of SmartGlass”. In the announcement, Microsoft are keen to show that Xbox is evolving beyond a single device to a set of entertainment services. At present their services only reach 35 countries that looks set to expand to 222 with the launch of Windows 8 later this week. Essentially, Microsoft is expanding the service to encompass more of the territories that they sell Windows in, after all, how else will new Xbox Music users get their six months of free streaming? Regardless of the console being present they are keen to leverage the Xbox brand to market their revamped music and video services. 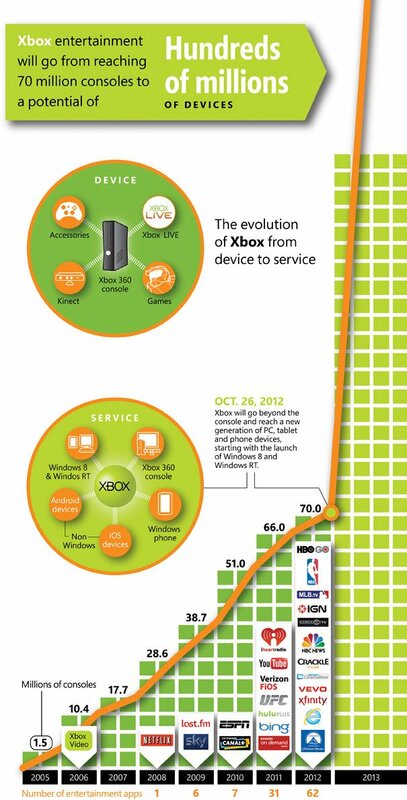 Taking their user base from 70 million consoles to practically every new PC sold. They also announce that from this fall, US customer will be able to take advantage of the “Entertainment For All” pricing plan (mentioned back in early May). It will allow consumers to grab an Xbox360 for $99 when they sign up for two years of Xbox Live subscription. It will be available at Best Buy, GameStop, Walmart, Toys R Us and the Microsoft Store. Got Windows 8? Free streaming starts now, ends in six months time! 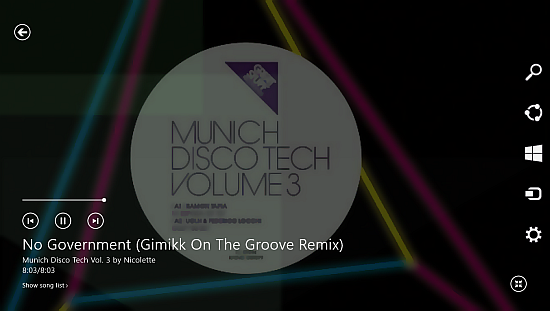 Microsoft have pushed out updates to the Window 8 Xbox Music and SmartGlass apps today. Quick take, SmartGlass functionality is now complete as per the video walkthrough, allowing the web sessions to be taken from Xbox to Windows 8 etc. Free Streaming (Starting from today) - Now allows you to stream artist’s using Smart DJ or to select an Artist and play their content for free. Xbox Music Cloud – “Keep music on this device in sync with other Xbox Music devices” and “when I add a song to my music on other devices, download here too”. Previous Purchases - Also, as expected, all music purchased through Zune is now available to download thought Xbox Music to your tablet/PC or to simply stream. You can’t use “Play To” from Xbox Music free streaming on your Windows 8 machine to send to your Xbox – you’ll need to get the Music Pass for that. You can send free streamed music to a Bluetooth device so it’s not completely restricted. Navigate your Entertainment – Your phone and tablet will become the best remote controls in your house. Use the touch screen on your smartphone or tablet to control your Xbox 360, and use your devices to pause, rewind or advance entertainment. TV & Movies – With Xbox Video, start a TV show or movie on your Windows 8 tablet and finish it on the big screen through Xbox 360; see the names of cast and crew for the film you are watching and discover related films. To give you one example of what you can expect, coming next season, HBO GO’s “Game of Thrones” will offer groundbreaking Xbox SmartGlass experiences. Sports – While watching the game, use a second screen to follow real-time stats, player bios, news and highlights you may have missed. All of this and more will be available for NBA Game Time, ESPN and UFC in the coming months. Music – Control your Xbox Music experience on the TV using your smartphone or tablet, discover related artists and songs, cue up additional music, read artist bios and more. Internet Explorer for Xbox - The Web comes to TV like never before with Xbox 360 and Xbox SmartGlass. With your smartphone or tablet, pan or pinch and zoom to explore the Web on the largest and best screen in the house, enjoy easy text entry with the keyboard on your tablet or phone, and then move your browser back to your device to take it on the go. Games – Get more from your game when you can use a second screen. Turn you phone or tablet into a virtual GPS in Forza: Horizon. Don’t stop the dance party in Dance Central 3 by going back to the menu to choose your next song. Instead, queue it up on your tablet or smartphone. In HomeRun Stars, use SmartGlass on your favorite device to throw a surprise pitch to your friend up at bat in front of Kinect. See detailed stats on how you are progressing in Halo 4, or check up on friends. All of these features and much more will be available when your favorite game extends to multiple screens. Also announced is a set of improved Bing updates for the console. 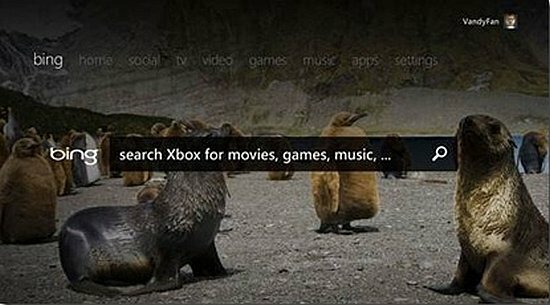 Search on Xbox has been around for a while but with the update comes expanded reach so voice search will now work in the following regions: Australia, Brazil, Germany, Italy, Spain, Mexico, France, Canada (FR), Ireland, Japan, Austria and Switzerland (FR and German). They claim to have improved the accuracy of voice searches along with expanded capabilities. Amongst them are the ability to search for music as well as search for movies by genre. A nice set of improvements to help make better use of that Kinect. As we wrote yesterday, Microsoft’s “three screens” strategy will only be made possible with effective services. SmartGlass is one of those services, it’s looking great on Microsoft’s own products and more importantly for us as Windows Phone users we should be in line for some nice baked in abilities from the get go. Keeping that browsing session going between console, phone and tablet looks awesome. We’re keen to hear what you think, so please so let us know in those comment below..